I only got through the first book earlier this semester before term papers took priority, but I had already started cooking up a paper about the dynamics of debt and gift-giving in the series and how they fit into the overall depiction of political subversion and agency. I was really pleased to see this pattern continue in Catching Fire and Mockingjay. I also fell head-over-heels for Peeta. And that made me really annoyed with myself. I will not turn this into a rant or a comparison to Twilight and why Peeta is so much better than Edward (and how Gale is kind of a more mature Jacob). Instead, I just want to unpack the connections their story has to the aforementioned debt/giftgiving/subversion dynamic. So, this is how I usually see the love triangle in young adult fiction playing out**. The girl character is at a turning point in her life (adolescence, graduation, whatever) and finds herself caught between two love interests. One love interest represents her childhood and the security of what she has known. With this boy she can be sort of wild and tomboyish and maybe even live in the past a little. The other boy, usually new to her life, represents moving forward. He often pushes her toward new experiences, more mature behavior, and usually more traditional feminine behavior too. I feel like, aside from the extenuating circumstances of the Hunger Games and the revolution, the Gale-Katniss-Peeta triangle pretty much follows this dynamic until the hijacking development in the third book (I’m trying to be vague and non-spoilery). At that point the narrative takes on a sort of “you don’t know what you’ve got til it’s gone” quality, but the urgency and the violence that surround the lovers makes the situation more complicated than that. Usually I side with the first boy in the triangle because usually he represents more liberty for the girl, but in this case, the only real choice is to move forward. 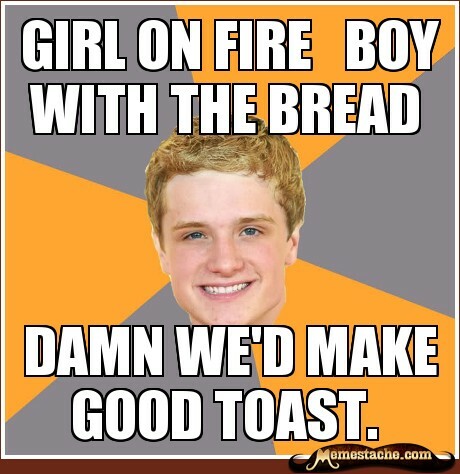 And, frankly, Peeta is a saint. Debt 1: The Districts and the Capital The entire world of the series is structured by the conceit that the districts owe the Capital a debt for the uprising 74 years earlier. They are kept in poverty, they are abused, and they are forced to send two of their children each year to fight to the death in The Hunger Games. This notion of “owing” blood for past violence comes screaming back in a disturbing way at the end of Mockingjay too. Debt 2: The bread Throughout their first Hunger Games together, Katniss struggles with the possibility of having to kill Peeta, not because she likes him but because she owes him. At the reaping she recalls, “To this day, I can never shake the connection between this boy, Peeta Mellark, and the bread that gave me hope, and the dandelion that reminded me that I was not doomed.” Throughout The Hunger Games, Katniss thinks of Peeta as “the boy with the bread” and connects that act to both an indebtedness to him and to his kindness. She struggles with understanding whether his kindness is strategic or genuine, but eventually the debt of the bread is overridden by the debt they owe each other for sacrifices made to get both out of the games alive. The memory of this debt becomes important again in Mockingjay. Debt 3: Lives saved and lost Especially in Catching Fire and Mockingjay, Katniss struggles with the guilt of others dying for her or because of her. As her subversion gains a body count and after she is sent back into the Games, she mentally keeps a tally, which starts to weigh her down. As much as she tries, she doesn’t feel like she can ever shake how much she owes other people. That’s part of why her nightmares and PTSD never cease. The dead never leave her. Can you every pay someone back for a life lost? Debt 4: Gale’s Protection of Her Family Regularly, her relationship with Gale comes down to his ability to protect Katniss’s family. She asks him to take care of them when she is sent off to the Games, and she helps provide for his family in return when she comes back a victor. The cycle repeats when she’s sent back to the arena. This pattern represents a similar debt to the one she owes Peeta for the bread and for her life. Ultimately (and for varied reasons), however, it proves a connection less powerful than her own survival. Gift 1: Mockingjay pin & locket Katniss’s friend Madge gives her a mockingjay pin to wear as a symbol of her district in the Hunger Games. This pin has a lot of heavy connotations. At first it symbolizes economic disparity between Katniss and Madge and the Capital. Later it represents subversion as the mockingjay is the result of a failed intelligence tool the Capital used during the last uprising. In vague ways it represents Katniss’s singing and her connection to her father. Later it becomes an outright symbol of the revolution. Peeta has a locket made to match the pin and puts pictures of Katniss’s family and Gale in it. He wears it as his tribute not only to symbolize his connection to Katniss, but also to manipulate her. Sorry, dude, didn’t work. Gift 2: Bread from District 11 & Rue’s flowers This is easily one of my favorite moments in the whole series. When Katniss is unable to save Rue, she adorns the girl’s body with flowers and sings her “to sleep” before the hovercraft comes to take her. It’s a beautiful moment of subversion, showing love and fidelity in the midst of such horror. That night, Katniss receives bread from Rue’s district: “I cautiously lift the still warm loaf. What must it have cost the people of District 11 who can’t even feed themselves? How many would’ve had to do without to scrape up a coin to put in the collection for this one loaf? It had been meant for Rue, surely. But instead of pulling the gift when she died, they’d authorized Haymitch to give it to me. As a thank-you? Or because, like me, they don’t like to let debts go unpaid? For whatever reason, this is a first. A district gift to a tribute who’s not your own.” Katniss’s life is saved by this act later in the games, but the bread and the connection between Rue and Katniss become symbolically important when Katniss visits District 11 on the victory tour in Catching Fire. Gift 3: Sponsor gifts Working through this fully would take a lot more time and words, but basically the sponsor gifts become a way for Katniss to communicate with Haymitch about her performance. The gifts represent not only something that the tributes desperately need, but also their value as competitors. Tributes only get sponsors in the first place if they are deemed worthy. Further, in Catching Fire the bread sent by district three becomes a symbol for communication as well. Gift 4: The pearl Another loaded symbol. When Peeta finds it while eating oysters on the beach during the second Hunger Games, it reminds Katniss and him of Effie’s incorrect statement that coal turns to pearls during their first Hunger Games. In a way, it represents what the Capital thinks it can do to Katniss and Peeta. More directly, it represents Peeta’s love for Katniss and she keeps it as a remembrance of him when they are separated. Thus, the pearl becomes a motif for Katniss’s love of Peeta “sneaking up on” her. I’m pretty sure Suzanne Collins designed this one just to make me cry. There’s so much more to tease out, but given that she’s been raised in a community of poverty, highly attuned to economy, indebtedness, and scarcity, Katniss’s attention to gifts and sensitivity to feeling indebted naturally make her feel caught between Gale and Peeta. Emotional constipation notwithstanding, there are more important factors than her heart even before you consider the threats made by President Snow. I think this economy of indebtedness is a strong twist on the traditional YA love triangle because of the way it raises questions about the politics of consumption, symbolism, code/double-speak, and Katniss’s internalizing her own agency or lack thereof. Each of these issues is entwined with the debts she feels she owes and the gifts she receives, and it is remarkable and important to see a teen heroine who works through these issues, understanding that when you don’t even have power over your own life, romantic love is not the most important thing. Friendship, duty, and promise, each represented by debts and gifts, are necessary for survival, if not triumph, in Katniss’s world. Finally, I actually looked up Josh Hutcherson and I feel bad for implying elsewhere and in print that he didn’t have any experience. He actually has a pretty full resume for an actor his age. Jennifer Lawrence is just so amazing she made him look green. Sorry, J-Man. On deck for this week: Mockingjay, Spectacle, and Critical Media Literacy and a post in which I confess that, actually, I finally do like Katniss Everdeen. *Unfortunately, this did not make my cold go away. **I did a close, comparative study of Wuthering Heights, The Secret Garden, and The Twilight Saga and that is where this information is mostly coming from. Admittedly WH is not YA Lit but 1) it predates the genre and 2) it heavily influenced the Twilight books. I’m so glad you came around on Katniss. I hadn’t thought a lot about all the gift-giving, though I was pretty upset when they changed how Katniss gets the mockingjay pin in the movie. I always took it as a symbol of solidarity between between the upper and lower classes of the district, of how even those “in power” in District 12 are still oppressed by the system. LOL to the good toast joke! Haha! One of the best I’ve heard so far. These posts about The Hunger Games books interest me greatly. I actually wrote a graduate term paper last semester on what happens if you read Katniss as at least a symbolically biracial character, since the biracial community embraced her as such. What I found was that a lot of historically portrayed stereotypes about “tragic mulattas” play out. In the romance triangle, Peeta becomes the symbolic white man and Gale the symbolic man-of-“inferior” racial status. In that light the different things Katniss feels she gets from these men and associates them with also stuck pretty close to a lot of traditional tales with biracial women choosing between a white and non-white male. In that light Peeta’s saintliness is sinisterly tinged with being the white man saviour of a female who is lesser-economically, socially via likeability status, less controlled as seen through their command of themselves (particularly in PR situations). That Peeta is usually in control of the narrative of their relationship makes Katniss’ ultimate ending with him an assimilation to the dominant, white, male culture. She even gives in and fulfills the traditional wifely duty of having children specifically for him after not wanting them forever. In that light this relationship and Katniss working like this for it could be her paying her perceived guilt-debt to society by submitting to another dominant, conventional narrative after blowing the violent, tyrannical storyline out of the water, if I readjust to focus more on the debt/gift aspects. Just thought I’d throw that out there. Also, I did really enjoy Peeta in the books as well-I was incredibly sad the movie removed his sense of humor. That was my favorite aspect of his character.